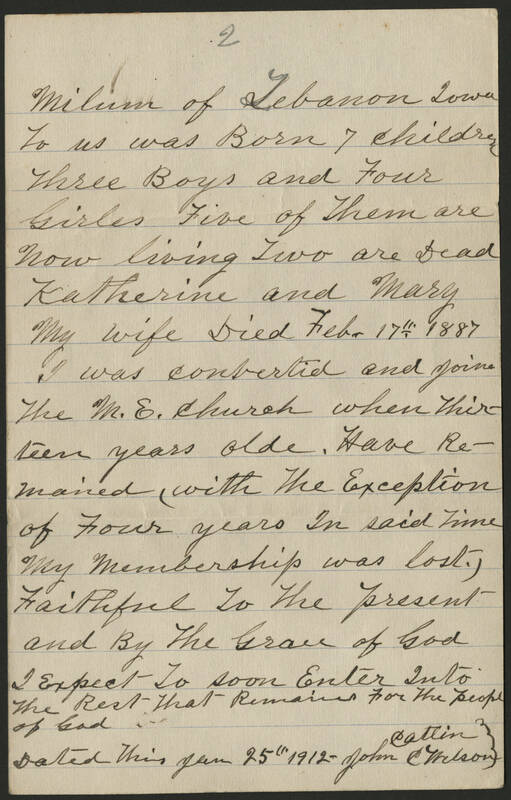 2 Milum of Lebanon Iowa To us was Born 7 children Three Boys and Four Girles Five of Them are Now living Two are Dead Katherine and Mary My wife Died Feb. 17th 1887 I was converted and joined The M.E. Church when Thirteen years olde. Have Remained (with The Exception of Four years In said Time My Membership was lost.) Faithful To The present and by the Grace of God I expect To soon Enter Into the Rest That Remains For The people of God. Dated This Jan 25th 1912 John Cattin C Wilson.